Credit Suisse Chief Executive Tidjane Thiam recently described Europe’s banks as “uninvestable”. The Swiss bank’s third-quarter results make it look like one of them. By keeping its total expenses from rising only slightly, the Swiss bank squeezed out earnings of 41 million Swiss francs ($42 million), well ahead of expectations from analysts polled by Reuters, who expected a 120-million Swiss franc loss. Yet profitability is under pressure in Credit Suisse’s wealth management and trading businesses. Adjusted for one-offs, Credit Suisse made progress on costs. The bank now exudes confidence that expenses will come in below its 19.8-billion Swiss franc target for the full year. Controlling overheads enabled Thiam and Chief Financial Officer David Mathers to absorb a fresh 357-million Swiss franc provision for litigation, chiefly related to an expected forthcoming settlement for allegations of mis-sold mortgage securities in the United States. Wealth management struggles should temper investor enthusiasm, though. In all of Credit Suisse’s private banking businesses the net margin, which measures pre-tax profit as a proportion of assets under management, was lower than in the previous quarter. The overall net margin was 26 basis points, down five basis points from the second quarter. By contrast, rival UBS managed to increase its net margin slightly over the same period to 27 bps. A continued decline in equities trading is another reason to fret. Credit Suisse was once a top-three player by revenue, but after a more than one-third year-on-year decline – worse than at its main rivals – it placed sixth this quarter. In the bank’s global markets division, which excludes trading revenue in Asia, returns are dropping well below its probable cost of regulatory capital. Thiam’s big push into Asia may also be serving up extra risks. Credit Suisse blamed a third-quarter 38-million Swiss franc provision for credit losses in its private banking business there on loans secured against shares which had plunged in value. The bank says there were only a few such impaired loans, that the average loan-to-value ratio for such lending is 55 percent, and that the losses were very unusual. But it’s a reminder that Credit Suisse’s growth push in the region – which is central to Thiam’s ambitious targets – brings new dangers. In the meantime, Credit Suisse’s margin pains may continue to undo any diet-driven gains. Credit Suisse on Nov. 3 reported third-quarter earnings of 41 million Swiss francs ($42 million), confounding analyst expectations for a loss. The Swiss bank's small profit came despite a fresh provision of 357 million Swiss francs for legal bills. The performance was helped by costs increasing by just 2 percent. Credit Suisse said it had achieved a 2 percent reduction year-on-year in its quarterly adjusted operating expense at constant currency rates, and Chief Financial Officer David Mathers told analysts the bank was on track to beat a full-year adjusted cost target of 19.8 billion Swiss francs. In Credit Suisse’s wealth management divisions, net margins, which measure pre-tax profit relative to assets under management, were lower. In the Asia-Pacific division the adjusted net margin stood at 17 basis points in the third quarter, down both year-on-year and from the previous quarter. The international wealth management unit's margin declined to 25 basis points. And in Switzerland the margin was down 7 basis points quarter-on-quarter to 35 bps, though up slightly year-on-year. 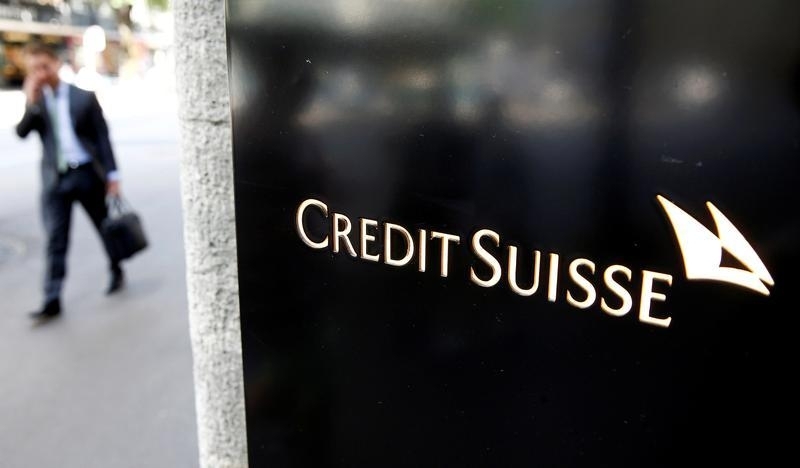 Credit Suisse's global markets division, which excludes trading revenue in Asia and Switzerland, recorded a return on regulatory capital of 4 percent in the third quarter, down on previous periods. Meanwhile, Credit Suisse said that a higher provision for credit losses in its Asian private banking business was in relation to a small number of share-based loans in Hong Kong which were impaired "due to their collateral values abruptly falling below their loan amounts". By 0839 GMT, Credit Suisse shares stood at 12.70 Swiss francs, down 4 percent from the previous day's close.